While I don't like uneccessary fat hanging off my meat, a fatty cut of bacon, a well-marbled steak, a paper thin slice of speck, or a nice fatty sausage brings nothing but a smile to my face. Fat keeps things moist and juicy, and makes things taste really good. When it comes to meat, I'm of the opinion that a little fat can often be your friend. So, when I choose ground turkey for burgers, it has more to do with the fact that I really love the flavor and price of ground turkey than it has to do with a concern about saturated fat. The only problem with turkey is that the low fat content makes it easy to turn that lovely turkey into a dry little hockey puck. This is why I have taken to loading up my lean ground turkey with thick, crunchy, salty, fatty, porky bacon. YES. The bacon makes the turkey taste amazing and helps keep it moist. And when the bacon is in the burger, it doesn't slide off and fall to the side when you try to take a bite. Way easier to enjoy every bacontastic moment. Yeah, I'm one of those bacon people. I never thought it would happen, but it has, so I'm rolling with it. I used Black Forest Bacon this time around, acquired at my local Whole Foods store. This bacon is sliced extra thick and smoked over cherry wood for a totally porkgasmic experience. If you don't do pig, you could use turkey bacon. Although I'll eat turkey bacon with pleasure, it is no where near as delicious or crispy. It is merely a shadow of true bacon. But, it is better than no bacon at all, and it will get the job done - except there won't be any bacon drippings leftover to fry your burgers in. I know, my newly acquired love for bacon drippings goes against all principles of "good nutrition". But when something tastes this good and my body actually processes it without a hitch, I can't say no! 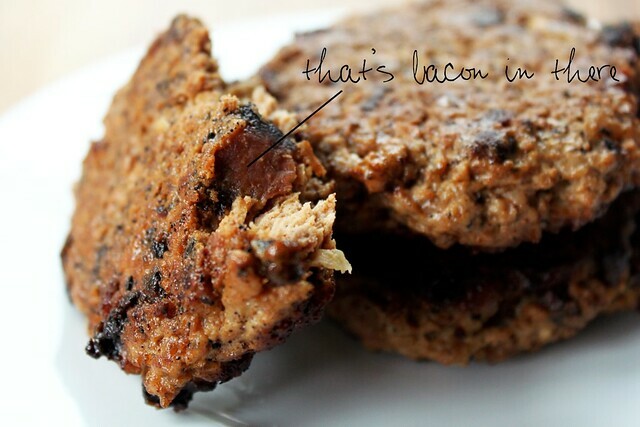 Maybe the idea of frying burgers in bacon drippings makes you squirm - not so long ago I cringed at the idea myself. But really, it is amazing. The flavor is incredible, and since you'd need to add a little oil to a pan anyway to cook that lean turkey burger, why not use what's already there? See my point? Your farm dwelling great-grandparents probably did it all the time, so listen to grandma and give it a shot. I like using grated onion in burgers rather than diced onion. Why? You don't get that horrible chunk of raw onion amidst nicely cooked meat. That is my biggest burger pet peeve. Grated onion dissolves into the burger, leaving a pungent onion flavor without a disruptive chunky texture. Fry bacon until crisp in a saute pan or a griddle over medium-low heat (I like to use my Lodge double burner cast iron griddle). Once bacon is crisp, remove from pan and blot off extra fat with paper towel. Let cool completely, then finely dice bacon with a large knife and set aside. Whisk together mustard, oil, onion, anchovy paste, spices, salt and pepper until smooth, then add turkey and bacon crumbles. Mix well with a fork, being careful not to compact meat and distributing the ingredients thoroughly and evenly. 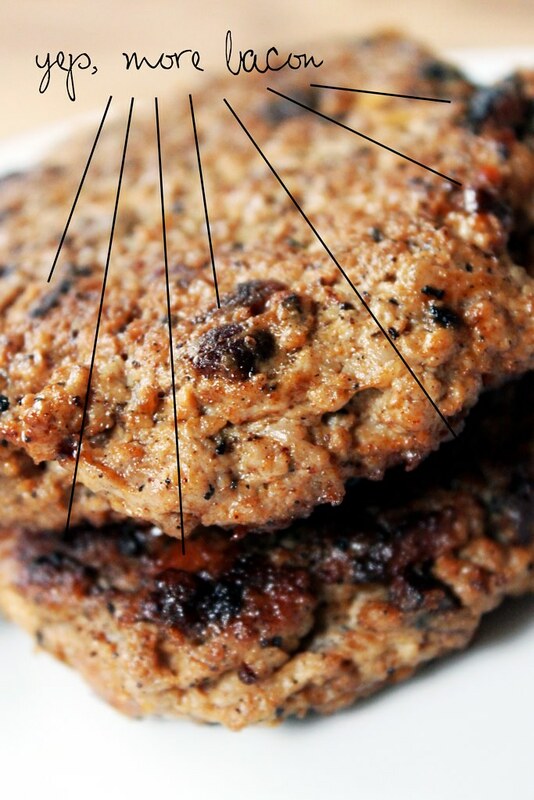 Divide meat mixture into 4 parts and form burger patties, handling meat as little as possible. If using the bacon drippings to cook the burgers, skim or scrape off any burned up pieces of bacon from the oil in the pan/griddle, then re-heat over medium heat. If using another oil instead of bacon drippings, heat oil in a clean pan over medium heat. Then place burgers in pan/on griddle and cook for 4 – 5 minutes per side, or until cooked through, handling as little as possible. If necessary, cover burgers with a splatter screen so you don't get hot oil splatters everywhere. Whatever you do, do not overcook the burgers! Remove them just a hair before you think they are done, placing on a plate and covering with aluminum foil or a large pan cover. Let sit for 5-10 minutes covered (meat will continue to cook and juices will set), then serve, either on a bun or as a standalone serving of meat. If you prefer to grill them, place on a grill over medium-high heat, and cook for 5-7 minutes, or until just cooked through. Remove them just a hair before you think they are done, placing on a plate and covering with aluminum foil or a large pan cover. Let sit for 5-10 minutes covered (meat will continue to cook and juices will set), then serve, either on a bun or as a standalone serving of meat. As a side note, if possible, I would recommend cooking them on a fine-mesh grill screen, as turkey tends to be a bit more fragile on the grill.